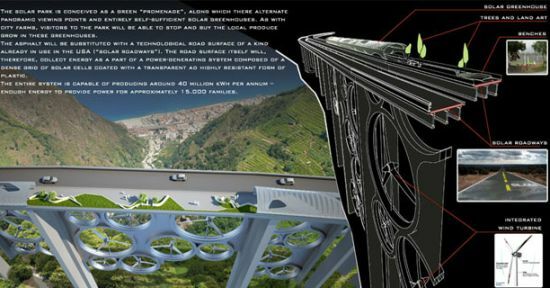 Conceived by Italian designers Francesco Colarossi, Giovanna Saracino and Luisa Saracino, the Solar Wind promenade concept was adjudged as the second best entry at the international competition Solar Park South, organized by the Department of Urban Planning and Territorial Administration of the Calabria Region. With its aim to stimulate the reuse of highway sections between Scilla and Bagnara, the proposed promenade will replace the original viaduct in Salerno-Reggio Calabria motorway. 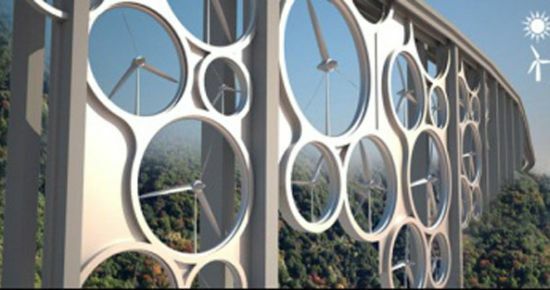 The sculptural walkway will promote use of renewable energy resources, connection between countries and sustainable tourism. 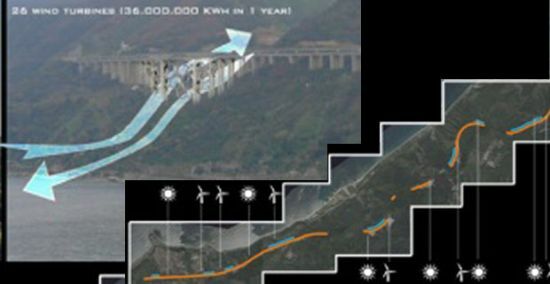 The Solar Wind installation will rely on 26 hybrid wind-solar blades to produce about 36 million kWh of renewable energy a year, thanks to strong air currents that keeps flowing through the stretch of the Calabrian coast. Designers and developers plan to coat the road that crosses the bridge with an innovative road surface called solar road. The solar road contains a dense network of solar cells coated with a transparent, high strength material, which promises to generate 11.2 million kWh of energy.Energy, thus produced, which reads somewhere around 47 million kWh, will be sufficient to meet the energy requirements of about 15 thousand Italian families. Moreover, the road will feature a pedestrian lane and a shopping mall where people can buy locally produced, fresh products.